In the world of drag, it’s one thing to be able to win over an audience. It’s another thing to be able to put on a show. Even then, putting on a show is more than just singing song after song. There needs to be a rhyme and reason. It is, in a way, a theatrical art. The Laurie Beechman has played host to an assortment of RuPaul’s Drag Race alumni, offering an array of show styles. From literal concert to emotionally driven cabarets, the stage has seen it all. But sometimes, a queen sashays in and elevates the playing field with their unmatched talent and ability to craft a fully realized show. Enter Jinkx Monsoon. 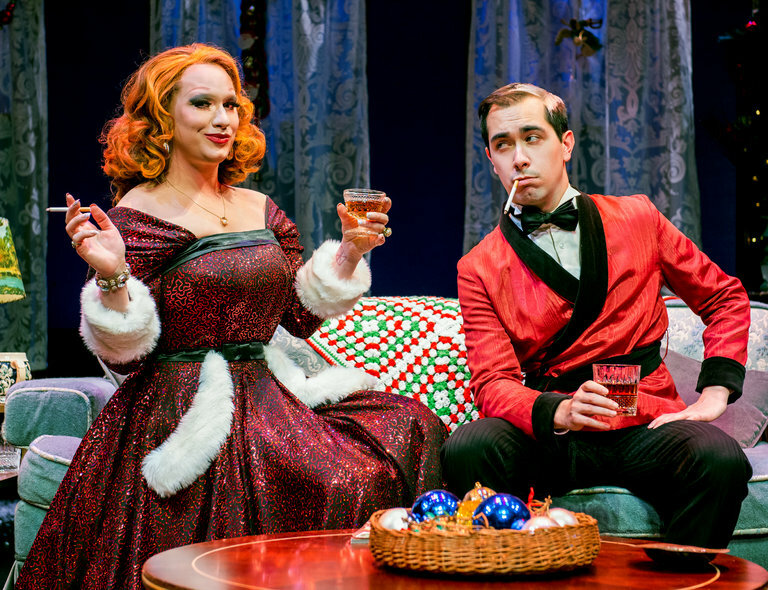 Seattle’s premier Jewish narcoleptic drag Queen Jinkx Monsoon and her pianist/collaborator Major Scales bring their latest holiday extravaganza Christmas Mourning to the stage. How can the duo have a Christmas show with virtually no holiday tunes in their songbook you ask? Well by creating a perfectly structured narrative. Fans know Jinkx for her slightly passive humor and unique styling. Most queens are forced to stick to their known character but Jinkx and her innate ability for theatrics manages to maintain the Jinkx persona yet add a new dimension through her hatred of the holiday. It was a different side of Jinkx yet it was still the Jinkx we know and love. So if holiday-hating Jinkx is dismayed at the world, she’s able to pass over Christmas classics and do what she wants. And it still fits in to the holiday narrative by crafting an evening of comedy with a genuine story arc. Jinkx Monsoon is a rip-roarious comedy maven. It seemed quite hard to maintain momentum after starting the show with a dazzlingly stirring cover of “Life on Mars.” But she did! It’s true, with her unrivaled vocals, Jinkx can sing anything. While not quite a solo show, the dynamic between Jinkx and Major Scales is unmatchable. Their ability to rib one another kept the comedy at a high. To cover up a costume change, Major Scales got his moment in the spotlight. To keep the audience on board, Major Scales sang Jinkx’s newest hit track on the Christmas Queens 2 album “Passive Aggressive Christmas. It was a smart choice to say the least. Jinkx Monsoon and Major Scales may have been mourning but the audience sure wasn’t. Christmas Mourning is a practically perfect holiday treat that will leave you tickled.